If I spent as much time reading the book as I have watching podcasts and interviews with Balague I would have finished it by now! just listened to The Game podcast from The Times this evening - Gab Marcotti interviewed Balague (spelling? ).....well worth a listen. At one point Marcotti says something along the lines of "presumably he won't stay at Spurs as long as fergie stayed at Man U". Balague immediately interrupts him and says "why not"!! He then says MP has already been asked by two other clubs and has said no each time. One I imagine is Man U. Any idea of the other? Chelsea??? Gotta be West Ham, about 11am this morning. I'm looking at the Forbes Top 20 clubs, and I don't really see which other jobs you'd drop Spurs for outside of the Big 5: Barca, Real, Bayern, Juve, and Man. Utd. There are bigger clubs than Spurs on the list - Milan, Inter, maybe PSG, maybe Dortmund, maybe Roma, maybe Atleti - but for various reasons, none seem hugely appealing just now. Serie A is kinda miserable, and Ligue 1 is second rate. Dortmund and Atleti have significantly less financial clout than Spurs. You could say Man. City and Chelsea, but I can see lots of reasons why an ambitious manager might not take those jobs. Or, at least, why the challenges at Spurs would be more appealing. As for the big 5, Barca are unlikely with the whole Espanyol thing; Real is the least MoPo set-up ever; and Juve almost always appoint old boys and Italians. That leaves Man. Utd. and Bayern. Both are very MoPo clubs, and he'd be perfectly suited to either. These are the two I'd worry about. Jose is doing ok, but doesn't look entirely comfortable out of London, and I don't think he'll stay beyond medium-term at most. Bayern are on the look-out as we speak. They may give Heynkes next season if he wins the BL, but it'll be a fresh face there not later than season after next. After our first season at NWHL. Who knows what will happen. 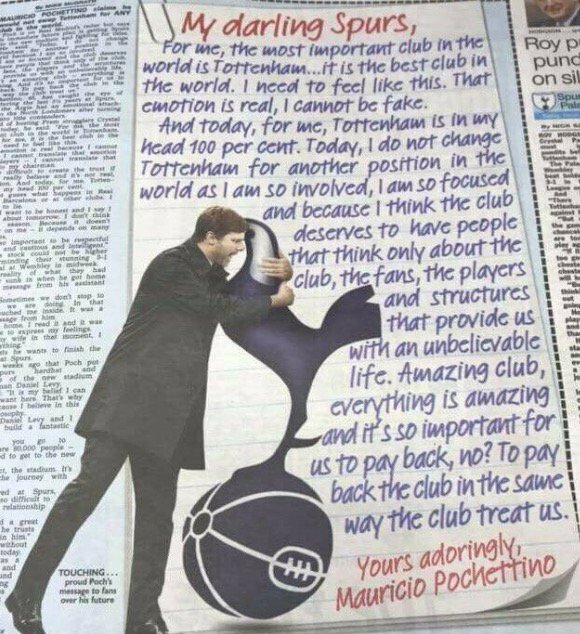 But, Poch’s clearly loving his time here, feels genuinely appreciated for his contribution, and he feels genuine appreciation for everyone around him and everything that’s happening at the club. Spurs has transformed him as much as he’s transformed the club. He’s obviously aware of the interest from other big clubs, but he’s expressed his love for the Spurs project and how he’s a huge part of that. Pretty sure he’ll be there for our new stadium next season, and that’s enough for right now. Don't think we've got anything to worry about tbh, he has made known his commitment plenty of times and een gone on record to say he'd sign a 15 year contract. I think the only way he leaves is when Levy upsets him one way or another but I don't see that happening. Poch leaving really isn't something I'm worrying about. He clearly loves his job, loves his players. As long as Levy matches his ambitions he isn't going anywhere. We have a brand new stadium around the corner and the best training facility in the UK if not Europe. Unless Levy starts selling our star players from under him he'll be with us for at least another contract. What’s this interview with him on sky sports? I caught a glimpse but it’s weird cos he’s looking directly into the camera, is it like a Spurs tv thing? Press conference for his book. Based on his comments, one thought stays in my head: he wants to stay because he would be remembered forever if he puts us on the same level as Madrid/Barca/etc. He'll be just another, albeit great, manager in other big clubs' history. Please be gentle Poch. Don't break the chicken's neck. Please be gentle Poch. I've been hurt before and have trust issues. Mark his name: Kevin Darling, at Yahoo sport. When he’s trying to impress girls, Mauricio Pochettino probably tells them he has won four trophies in his management career. Unfortunately, these are all Premier League Manager of the Month awards (October 2013, September 2015, February 2016 and April 2017 if anyone’s interested). Fine achievements in their own way, but probably not enough to make a woman fall in love with you. For all his tactical and motivational wizardry, The Poch still needs silverware to call himself one of the greats, and he’s currently in charge of a team that has won the sum total of two Rumbelows Cups in the past quarter-century. The Argentine is reportedly being lined up by the Red Devils as a replacement for Jose Mourinho, who is rumoured to be considering quitting Old Trafford for Paris Saint-Germain. And even if the Special One doesn’t up sticks to Paris, Spurs still aren’t out of the woods, because PSG would then turn to Pochettino as their second choice. This would apparently spark some kind of “managerial merry-go-round”, the outcome of which is unknown but – in a worst-case scenario – could result in Gerry Francis returning as Tottenham manager. Interesting overview. I personally can’t see him moving to another English club, Levy would have his balls in curtains. Real Madrid is a mabye for sure, he loves Spain and hates Barca, but I agree he may not like their set-up. Can’t really see him moving to Germany for Bayern. PSG yes as he used to play there and is a chance to win trophies. Other options are back to Newells old boys which he said in his book he’d like to do and also Argentina Job but think that would be 4-5 years time minimum probably more like 10+ once he’s archieved things at club level. I think if his family stay happy in London and he keeps believing in the project and we keep our players and keep backing him I’m confident he will be here for a good few more years. Real Madrid and PSG - short term. Newells old boys and Argentina - longer term. Also once the new stadium is build and he starts leading us out at that I think he will fall even more in love with the project. Some people are like that, the purists, he is a purist. Not to say he won’t go to a Real Madrid or PSG one day as technically financially etc they have more resources than us so in theory more chance to win trophies but I think if we keep moving forward and backing him and his family and close team of workers are all happy he will 100% stay. It’s like on football manager back in the day, you can manage barcelona or Real Madrid or Bayern etc and win league and cups and mabye CL fairly easily but it’s much more satisfying taking on a club which you can progress like one you get promoted or one who was mid table and you get them challenging for Europe or in our case one who was on fringes of top4 into near title contenders and CL competitors(tbc). Mouriniho is the kid who on football manager picks the easiest jobs to win trophies but it’s the achievements of say a clough at forest or ranieri at Leicester or simione at atheletico etc they’re the achievements that really mean something and if he stays and he wins us just one major trophy, that feeling for him and the players will be so so special. I just hope he keeps faith in the project. I can't help but think he is right. But at the same time I can't help but think it is not just about Mourinho, it is the whole culture at Chelsea, the whole ethos. A long time ago it became apparent that the main reason for Chelsea's youth set-up was to produce young players to sell to provide funding to help subvert financial fair play regulatuions. The joke, of course, is that Abrahmovich was instrumental in setting them up in an effort to prevent any other oligarchs fr om doing at any other club what he had done at Chelsea - bankroll them to success with unearned revenues pillaged from another country's resources. Whenever I say we have the best youth set-up in the division I am acutely aware that Chelsea's has some of the best personnel and does better in youth competitions than us. But it isn't set-up to even try to produce youth players for the 1st team squad. And it is very traditional in wanting evidently good players of the traditional profile in order to achieve immediate success. So much the better to be sold on.